Remember all those reports that Rowling wasn't going to release new Harry Potter books? It looks like I was right when I noted that Rowling was talking about Harry (as a character), rather that his wizarding world, because Rowling has three new Harry Potter titles up for pre-order. The Bookseller and other sources report that starting later this year Rowling will be publishing a new series of books set in Harry Potter's universe. Pottermore presents will feature short-form content including stories and articles, and will be available from major ebookstores. A spokesperson told The Bookseller that Pottermore Presents was created after the company realised not all J K Rowling fans visit pottermore.com. The material is designed to be accessed easily on mobile platforms. Although Pottermore has not made an official announcement about the books, Amazon.com, Barnes & Noble and Apple's US iBook store have listed three new titles for sale: Short Stories from Hogwarts of Power, Politics and Pesky Poltergeists; Short Stories from Hogwarts of Heroism, Hardship and Dangerous Hobbies; and Hogwarts: An Incomplete and Unreliable Guide, all published by Pottermore Presents.They are retailing for $2.68 and publication is set for 6th September. The first book, Short Stories from Hogwarts of Heroism, Hardship and Dangerous Hobbies, will profile two characters from the original series: Minerva McGonagall and Remus Lupin. 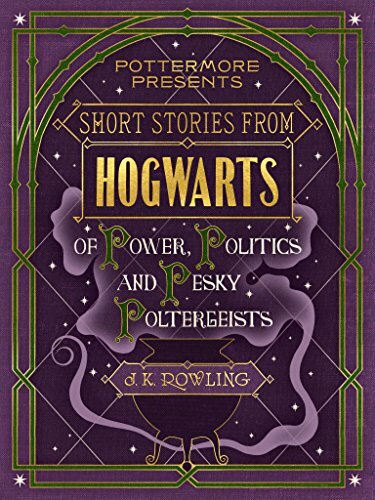 The second, Short Stories from Hogwarts of Power, Politics and Pesky Poltergeists, is going to offer a "glimpse into the darker side of the wizarding world, revealing the ruthless roots of Professor Umbridge, the lowdown on the Ministers for Magic and the history of the wizarding prison Azkaban" as well as details on the back stories of Lord Noseless and Horace Slughorn. And the third ebook, Hogwarts: An Incomplete and Unreliable Guide, will take readers "on a journey to Hogwarts School of Witchcraft and Wizardry. You’ll venture into the Hogwarts grounds, become better acquainted with its more permanent residents, learn more about lessons and discover secrets of the castle . . . all at the turn of a page." The books average 60 to 80 pages each, cost $3, and will be available in German, Italian, French, and English. Rowling has previously released several spin-off books, including Fantastic Beasts and Where To Find Them (which is being turned into a three-part film series starring Eddie Redmayne) as well as a couple of the magic textbooks used by students at Hogwarts. This shows that my decision of stop reading the Harry Potter series is correct. I never read series that are not finished. I consider spin-offs, related books etc are a part of a series. I finished the first three Harry Potter books and thinks some parts are interesting, but some parts are boring. I think I will finish the whole series one day, but maybe it is better to wait until Rowling is 90 years old and won’t be able to write any more. I will go back to my 19 century classics now.